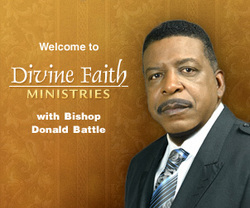 In 1990, out of obedience and the profound guidance of the Holy Spirit, he and his wife Gwen founded Divine Faith Baptist Church, now Divine Faith Ministries International (DFMI), with locations in Jonesboro and Buford, Georgia. Under his leadership, unfailing dedication and steadfast commitment, God has abundantly blessed the ministry and DFMI has experienced unprecedented growth, from 60 people in 1990 to a current membership of over 8,000. As a visionary leader equipping disciples for Christ, his genuine love for people, pursuit of personal holiness and integrity, combined with sound biblical preaching, and teaching have characterized his successful and flourishing pastorate; a result of which has afforded him the opportunity to minister throughout the U.S. and abroad, with a mission outreach in Haiti. Through Joseph’s Warehouse Outreach ministry, DFMI has become the number one distributor of food and clothing in Clayton County and surrounding communities. In 2010, again under the leading of the Holy Spirit and in an effort to bring together a covenant fellowship among pastors and leaders, Bishop Battle founded the International Covenant Christian Churches (i3C) fellowship. Bishop Battle’s commitment to the ministry, community empowerment, growth and development are evident in his community involvement and his ecclesiastical affiliations, which includes serving as Senior Pastor of DFMI and President of i3C.